Beautiful Velvet Feet growing out of log, look at the snow still on the ground! Mushrooms in March! A lot of things happened around here this summer. Some awesome, some not so much. Somethings came from habit, and some from adventure. Happiness, sadness, anger, laughter and a universe of other feelings ebbed and flowed in and out of existence as we lived our lives. It rained and then poured, and then dried up. Its raining right now as I write, and the world readies itself for sleep as winter looms close on the horizon. But thinking back to this spring, a wet one that made the history books, the first thing that really comes to mind are the first morel mushrooms of the season. I have written before about my forays out into the woods in the early spring, usually around mother’s day, looking for the treasured mushroom. And this year once again, I was lucky to find some. I have hunted the woods every spring now for more than 10 years, and I have never been disappointed. I don’t usually ever find too many, but sometimes I get lucky, or at least know somebody who does so I get a few good meals with the morels. 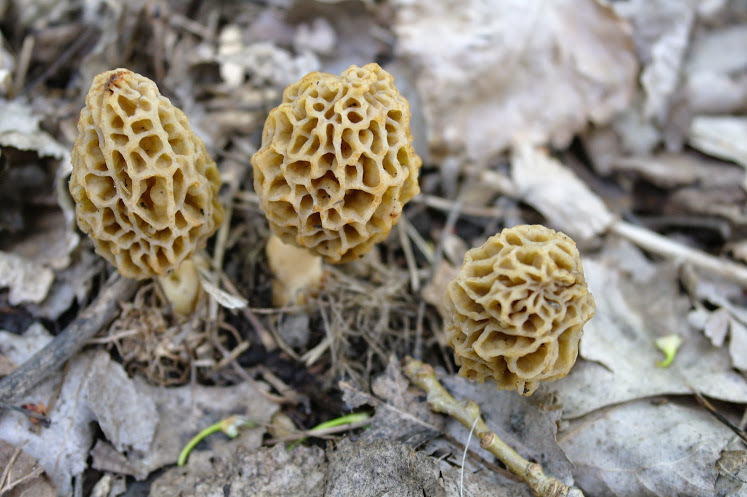 The morel mushroom may be one of the most treasured and sought after culinary mushrooms around, but there are thousands of other varieties of fungi just waiting to tell you their story. And that was one of my goals and accomplishments for this summer, to learn the stories and tales of as many mushrooms as I could. So when I came across these ones growing out of the straw under my backyard beehives early in the summer, I knew the hunt was on. There were two mushrooms specifically that I wanted to find and learn about. For many years now, I have heard about and researched both Chicken of the Woods and Chanterelles but have never found them. I knew for a fact that the Chickens, also known as Sulphur Shelf mushrooms, were a common late summer mushroom that was very easy to ID. I also knew that chanterelles grow throughout Minnesota, but had never met anybody who had actually found them. My mission was set before me, all I had to do was start. Beginning at the end of July, the kids and I went on hikes about every other day. 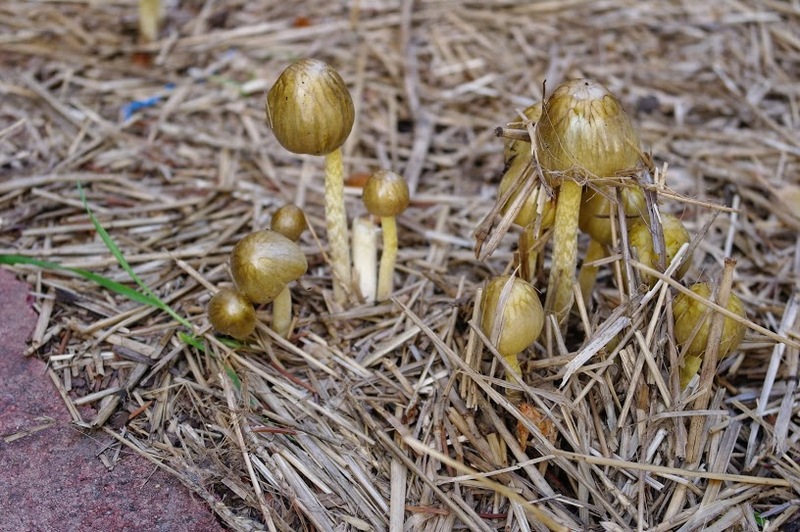 After a month of no rain, we finally had gotten a few small storms that moistened the landscape and all sorts of fungus began popping up in our yard and throughout the neighborhood. We didn’t always go out with the intention of hunting down mushrooms, but we always kept our eyes open, and more times than not some type of fungus would cross our path. One park in particular proved to harbor high levels of mycological life, and it was here that we concentrated our efforts in finding the Chicken of the Woods and the elusive Chanterelles. The key feature to this land that I think helps support such an abundant and diverse web of fungal life can be attributed to all of the oak trees that can be found throughout the park and hiking trail system. And not just the living oaks, but ones in all stages of rot and decay. It didn’t take long to find either mushroom. The Chicken came first in this story. 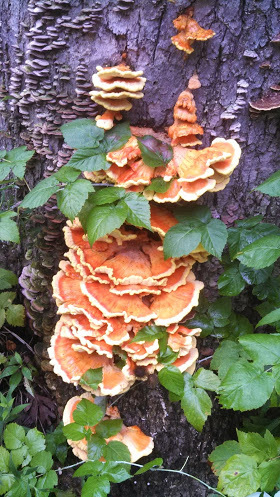 Growing off of an old oak log, was a gorgeous Chicken of the Woods, specifically, Laetiporus cincinnatus. 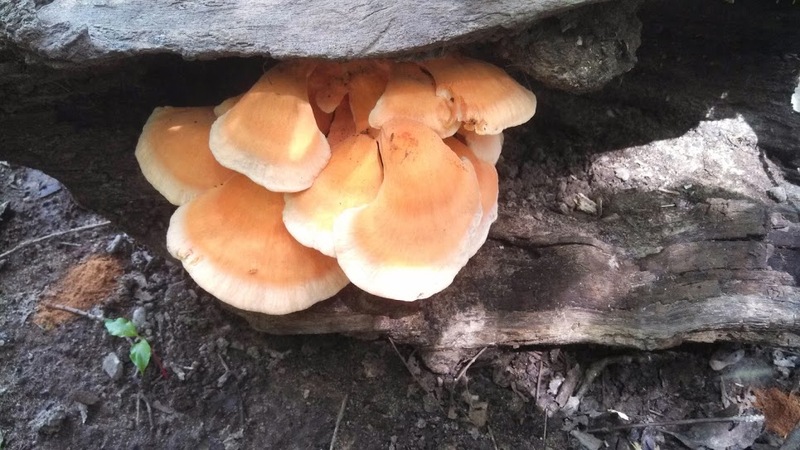 Chicken of the Woods or Sulphur Shelf mushroom comprise a few different varieties of Laetiporus, the most popular being cincinnatus and sulphureus, which are virtually identical to the untrained eye, though connoisseurs say that cinncinnatus is superior for eating. I have since found both of them, and both are delectable, and truly taste like chicken when sauteed in butter. 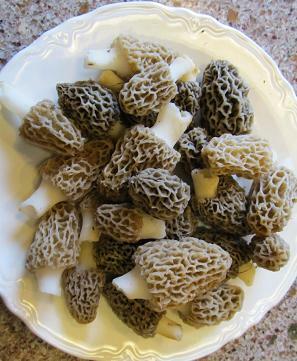 They are what many field guides consider choice eating, and are quite possibly the best mushrooms I have ever eaten! Not long after finding the Chickens, we found our first Chanterelles on a forested valley ridge. Chanterelles being a mycorrhizal fungus (a fungus that has evolved a symbiotic relationship with the roots of trees) were also found near living oak trees. The Chanterelle is a very elegant looking mushroom, with a very distinct apricot aroma. Lacking true gills, a Chanterelle can be identified by it’s ridges which display a forking pattern, rather than the parallel nature of mushrooms with true gills. The Golden Chanterelle, which is probably the most common species in the genus Cantharellus, does have a deadly look alike commonly known as a Jack ‘O Lanterns (Omphalotus olearius). 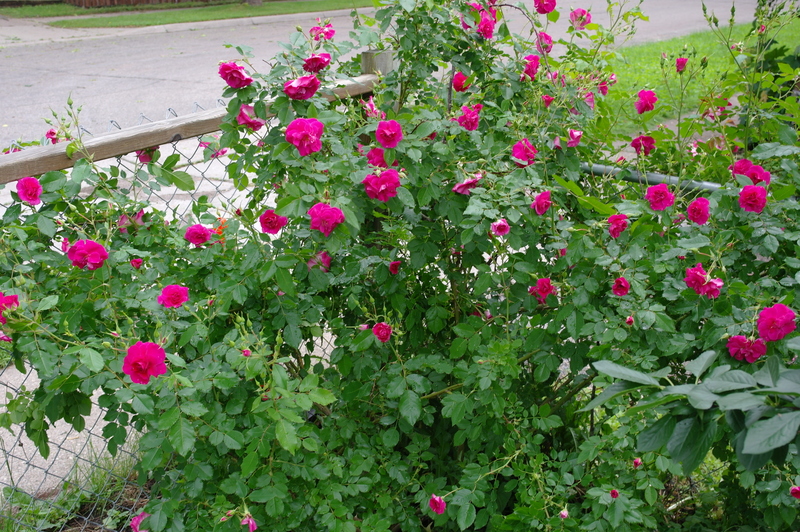 But once you become acquainted with the defining features and growth habit, they are easily told apart. In fact, I have never even seen Jacks, but I have heard that you should hunt them at night, because they glow in the dark! 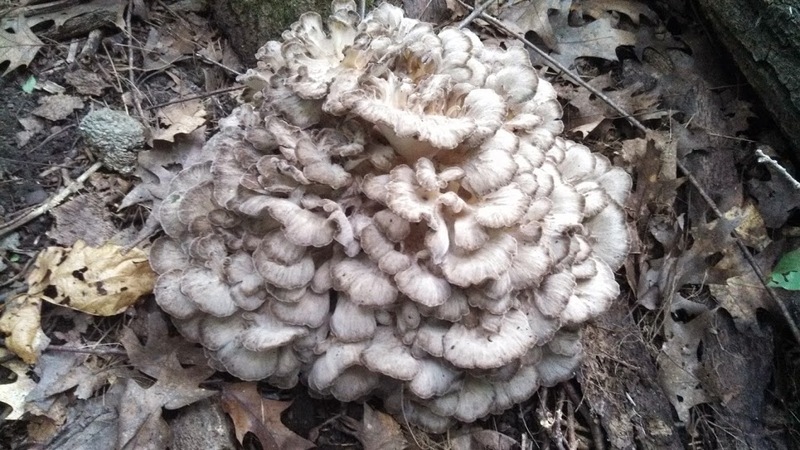 A dark horse candidate who takes 3rd place this year in the fungi challenge is what is known as Hen of the Woods. Another mushroom named after poultry, Grifola frondosa, is another mushroom that shows up in late summer in hardwood forests, often found at the base of oak trees. 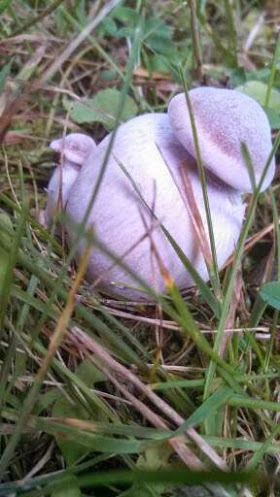 This is another mushroom that I had only ever heard about and never seen, but was pretty sure that I would know it when it found me. On a beautiful September day hiking with a group of happy fungus hunters, we found two massive specimens of Hen of the Woods! 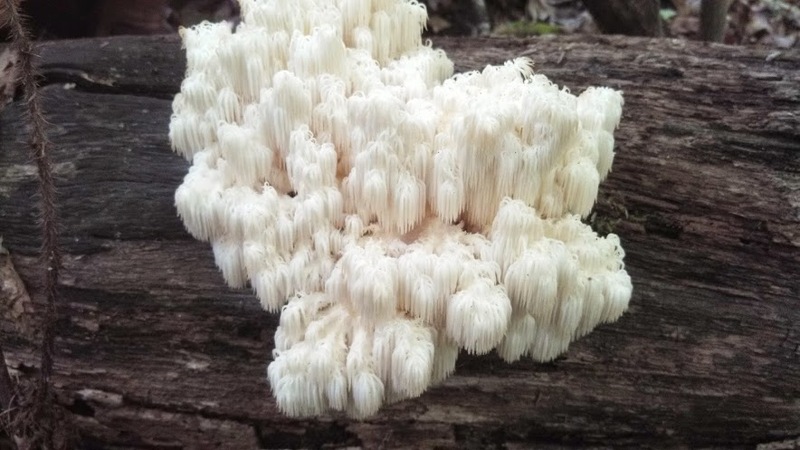 It is a gorgeous and crazy bracted mushroom that also goes by the name Cauliflower mushroom. They are great eating, and when you find Grifola frondosa, you will have a lot of mushroom to cook with, so get ready to be creative. 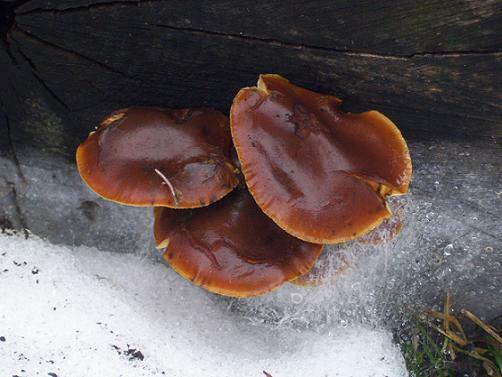 Soups, omelets, casseroles, and pizzas are all good candidates for this fungus! 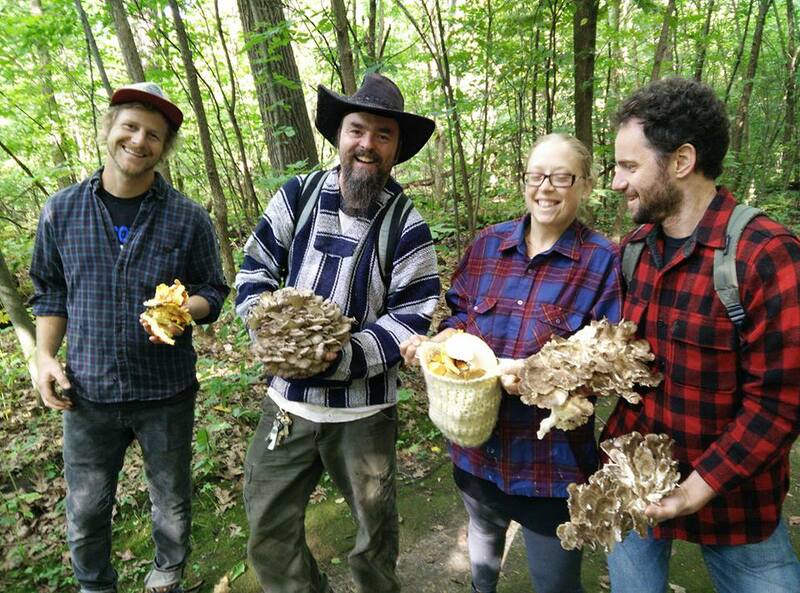 The same mushroom foray that yielded us the Hen of the Woods, was also one of the most epic mushroom hunts I have ever led or been a part of. Located in an enchanted forest that is perched on sandstone cliffs, and is filled with mossy ravines and boulders that glaciers deposited roughly 10,000 or so years ago, this magical piece of land was teeming with mycological wonders. Old Man of the Woods, Strobilomyces floccopus? 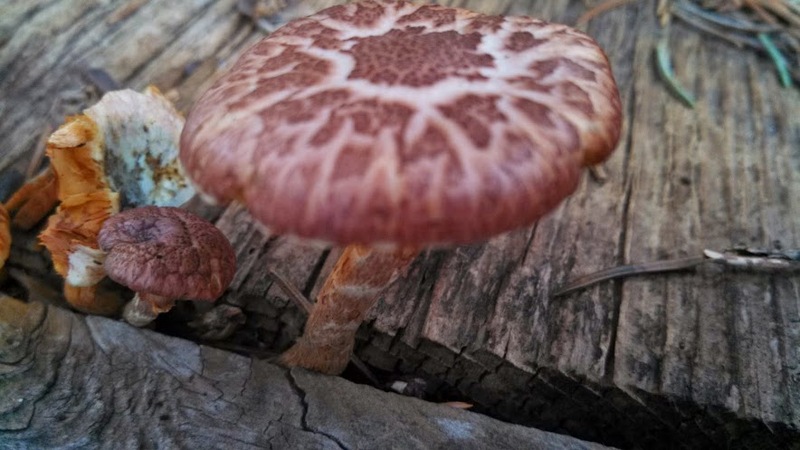 This maybe a psychedelic mushroom growing off of an old wooden shelf by my chicken coop…. In closing, I can more than say that I accomplished my mycological goals for this summer. Not only did I find and learn how to ID both Chicken of the Woods and Chanterelles, I also learned about Hen of the Woods, Dryad’s Saddle, King Strophia, Northern Tooth, a small variety of boletes, and many other mushrooms. While I feel like I know more about mushrooms than most people, I still have a lot to learn. 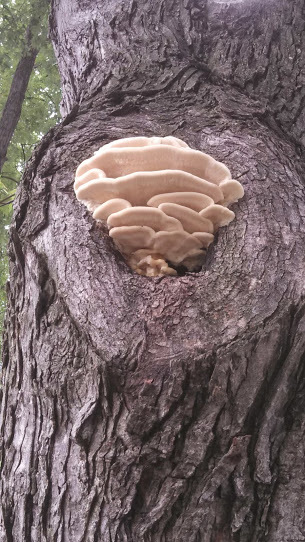 I am an amatuer mycologist, self taught, and definitely am not an expert. Even though I like to share my stories and experiences about and with mushrooms, I cannot stress enough how important it is for you to do your own research on mushrooms. 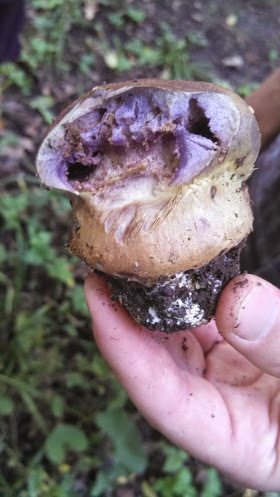 This is a King Stropharia, or also known as a wine cap. 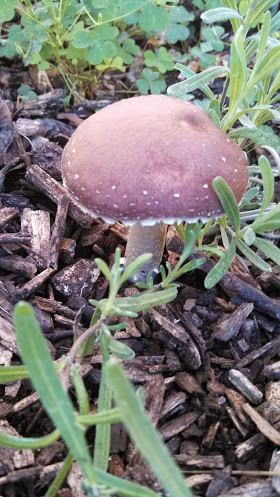 This mushroom was intentionally “planted” in these wood chips and is highly edible. 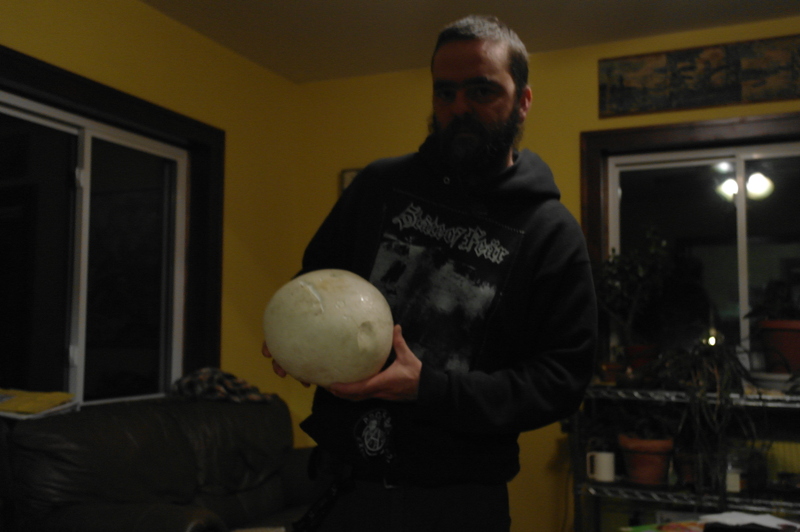 Here is a dark shot of myself and the giant puffball that I checked out from the library! Two nights ago I found myself at our public library, diving deep into the bowels of what the Affordable Care Act will mean for my family and what our options for insurance may be. Between looking at different websites trying to navigate this maze of government red tape, my mind would wander and my eyes would focus on the view looking down on the land outside of the library. Our library was built over 20 years ago on land that was one of the last remaining farmsteads in W. St. Paul, MN and it still contains a few aspects of what it once was. The fact that the county purchased this land for building a library (rather than a housing or commercial developer), was in certain regards a saving grace for some of the wildlife that called this little piece of Earth home. So while there is a big library building and parking lot, there are a few acres of land that hold the remnants of a small oak savanna, a pond full of ducks and geese, black walnuts, birches, maples, delicious fruiting mulberries, aronia bushes, wild raspberries and many other species of plants and animals. There is also a thriving underground network of mycelia; in other words mushrooms that also inhabit this small holdout of nature. Sitting there in the library, daydreaming of affordable health care, my eyes were distracted by a large, white orb maybe 30 or 40 yards away from me. From my vantage point looking through the windows, it was hard to tell exactly what it was – maybe a kid lost a ball, or someone lost a grocery bag to the wind, but whatever it was, my eyes kept coming back to it. Something inside me knew what it was all along, so before it got too dark outside, I packed up my bag and made the short hike to find out what this mysterious object actually was. Thar’ she be gettin’ weighed in … Yaargh! It took me less than five minutes to find what I was looking for, and let me say it was hard to miss! I have seen some puffball mushrooms in my life, but nothing like this! 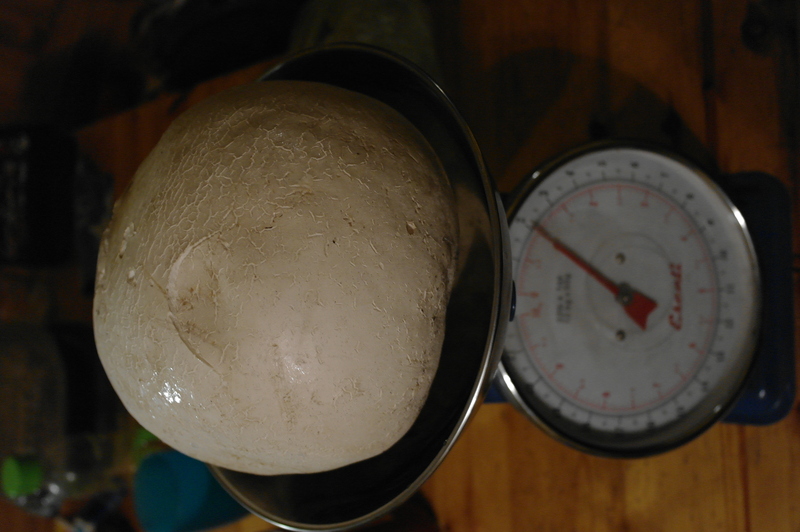 This Calvatia gigantea, or more commonly known as a giant puffball, weighed in at just over 2 pounds and was harvested at just the right time. It was the perfect age for eating, and had no damage from bugs. 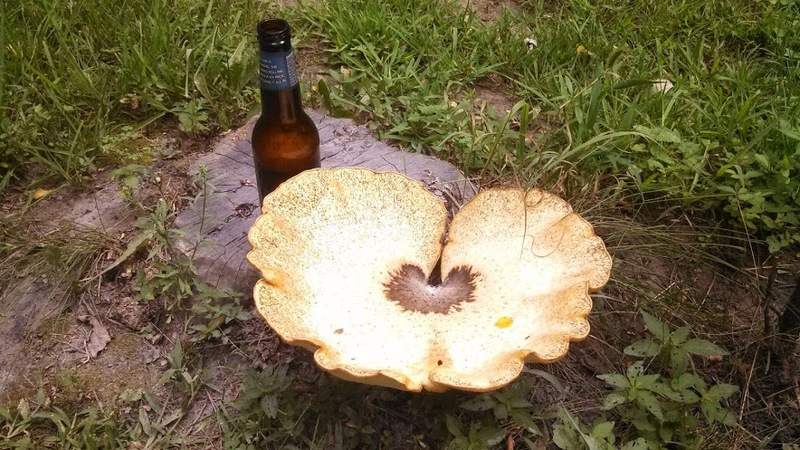 I gratefully harvested this gigantic fungi, and headed home to show my family. Mushrooms are an interesting food in our household. 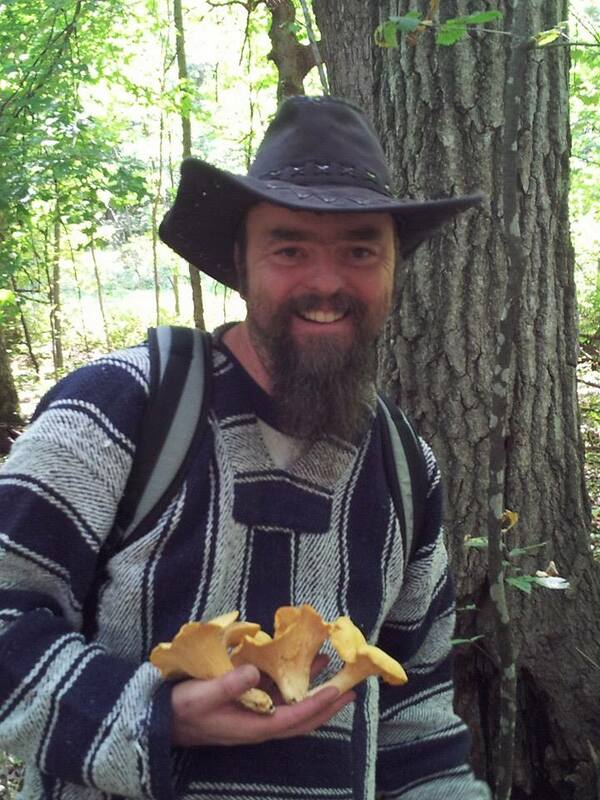 I am a crazy mushroom freak – I love hunting for them, eating them, and learning about them! My kids are slowly following in my footsteps and becoming a bit more adventurous when it comes to eating mushrooms, and my wife is allergic to all mushrooms so she keeps her distance. Needless to say, I am spoiled when it comes to mushrooms as there are very few mouths that I have to share my mushrooms with. Knowing that I could only eat so much on my own, I brought some of the giant puffball with me to work to share with a few folks who I know would appreciate such a find. Both of my bosses in the kitchen where I work love wild crafted mushrooms. The day before my find, we tried some sulphur shelf mushroom (Laetiporus sulphurues), which is a bright orange, highly edible mushroom common to Minnesota and most of North America. Two wild mushrooms in two days, not too bad! I ended up cutting thick slices of the puffball and sauteing the pieces in butter with a little bit of salt and pepper. How to describe them short of saying they were heavenly? They are very light with a noticeable, but subtle, mushroom flavor and a texture that literally melts in your mouth. In the National Audubon Society Field Guide to North American Mushrooms, giant puffballs are described as choice, which means don’t pass these up when you get a chance to eat them! 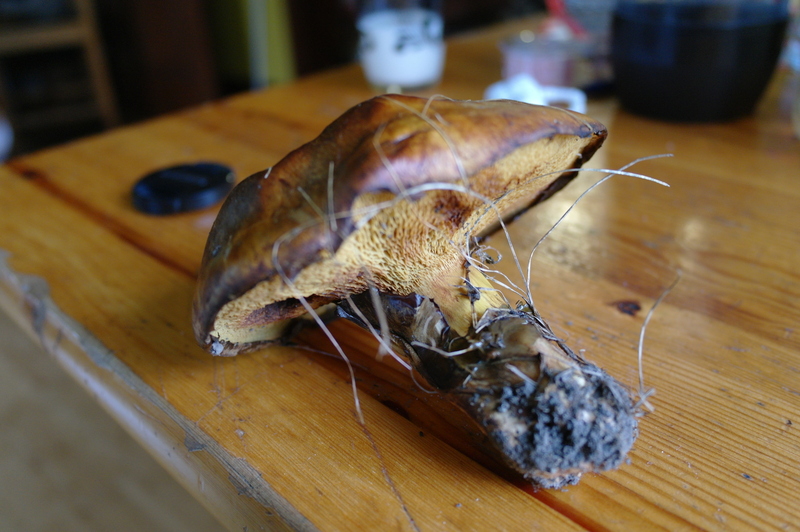 Here is the unidentified bolete from the library. Any guesses? Another mushroom that I found the next day, also on this same land at the library is some type of bolete. There were a few dozen of them growing in the footprint of a birch, so it leads me to believe that it is the birch bolete, or Leccinum scabrum or possibly the Slippery Jack that is comprised of a few other varieties of boletes. 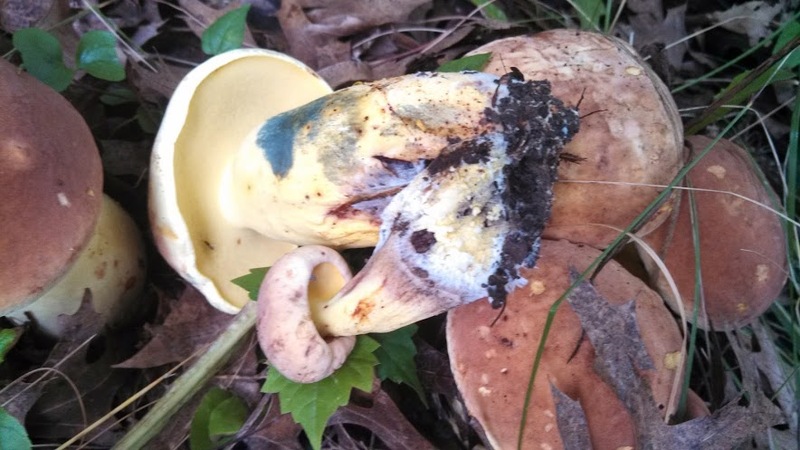 This is a perfect example of why it is so important to make a positive ID before consuming any mushroom. According to my Mushroom Field guide, boletes contain the largest number of edible species of any family of mushrooms. 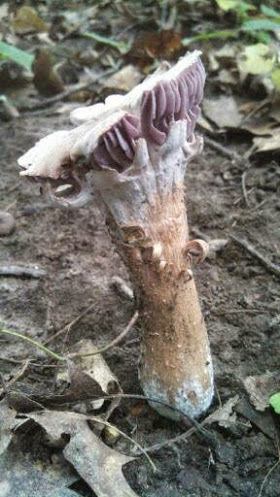 While there is a good chance that the one I found is edible, and most likely quite good, I will not be taking a bite until I can make a positive ID, which most likely will not happen this season. 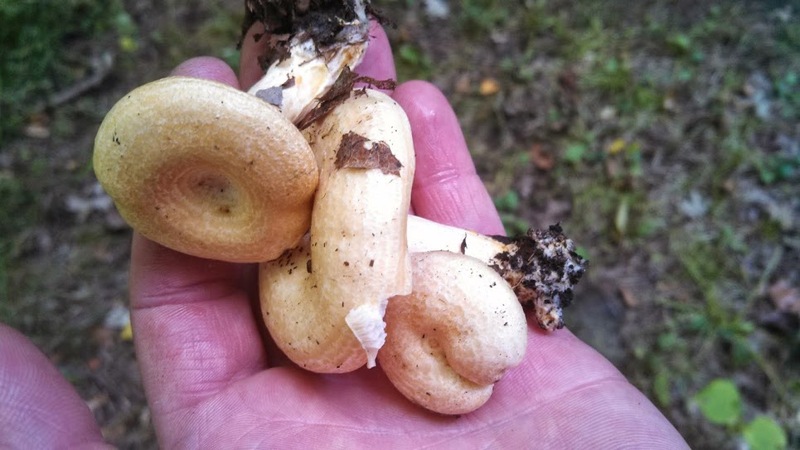 Making a positive identification of mushrooms can be done in a number of ways. The first and easiest is by visual observation. This works for some mushrooms without any problems. I was taught about the “FoolProof Four” which include Morels, puffballs, sulphur shelfs, and chanterelles. 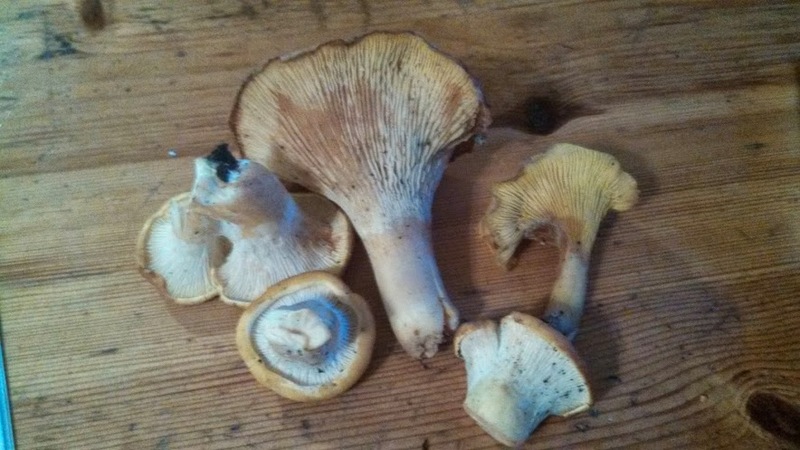 I have found three of the four and am still trying to track down chanterelles. From my understanding, chanterelles do have a few look alikes that are not good for you, so having some back up methods of making positive identifications for mushrooms is a good thing to know about. Other methods include knowing whether a mushroom has gills, pores, or some other way disseminating its spores. Aroma can also be a clue, like the first time I found Oyster mushrooms (Pleurotus ostreatus) there was an overwhelming smell of anise, which in the case of oyster mushrooms is an identfying characteristic. Location of where it was found can be helpful, but by no means does it prove anything about the exact species. And then there is a relatively simple test that you can do called a spore print (I will write about this sometime, I promise) that can also help you to ID a mushroom. While I will not go into detail here about a spore print test, it is a very helpful way in determining what a mushroom may be. 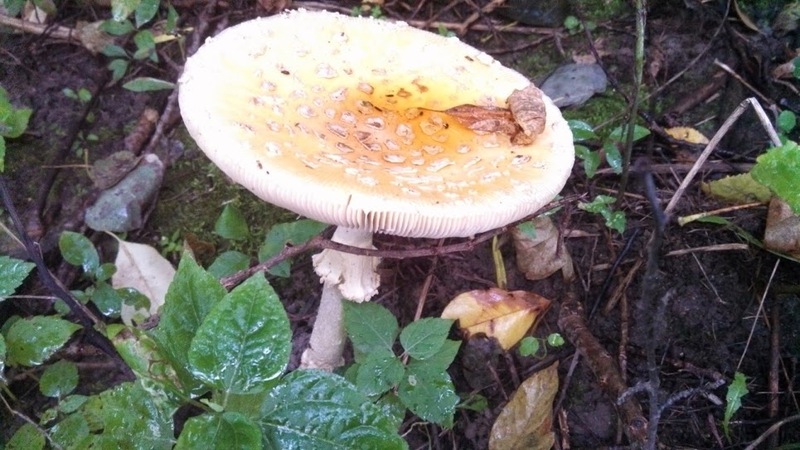 Ultimately, if you are into mushrooms and enjoy hunting them and eating them, then educating yourself is the most important thing you can do. The internet is very helpful, but personally I have found real life books to be more enjoyable when it comes to learning about mushrooms. The National Audubon Society Field Guide To Mushrooms has been indispensable on my mushroom forays throughout the years, for it is full of great pictures and very scientific descriptions that have lead to some neat discoveries. Another one that I have found helpful is Edible Wild Mushrooms of N. America by David W. Fischer and Alan E. Bessete. This book is not nearly as comprehensive as the Audubon Field guide, but focuses more on edible mushrooms and all the wonderful ways that they can be prepared and preserved. Yes it is bread we fight for, but we fight – for roses too!! Two nights in a row we have had giant thunderstorms. Big ones, like wind gusts of up to 80 MPH BIG! It may be the icing on the cake to a very wet spring, and as I enter into summer on this rainy, windy, and overcast solstice, I can rest assured that the gardens have been well watered and are ready for some sun . We have seen enough rain in the last three months up here in Minnesota to pull us out of a significant drought. Last year there seemed to be drought of epic proportions throughout the world, and now I have heard about floods in India and Canada and many other places – the pendulum of nature now swings erratically and finds it hard in this new world of global climate change to find equilibrium. While the world burns in ever growing forest fires, drowns in flash floods, and despairs in economic insecurity and social in-justice, our gardens grow. Through hard times and climate change, a garden well tended, even when faced with challenges, still can provide us with an abundance of sustenance, inspiration, and beauty. I want to show you a bit of that abundance, that which is growing and inspiring on one small half acre lot in the upper midwest of the U$A. A bowl of Honeyberries, and the world’s best strawberries – serve with homemade yogurt and you will be in gardener’s heaven!! I do not think I have ever had this nice of tomatos on the vine, this early in the season! Homemade salsa here I come!! 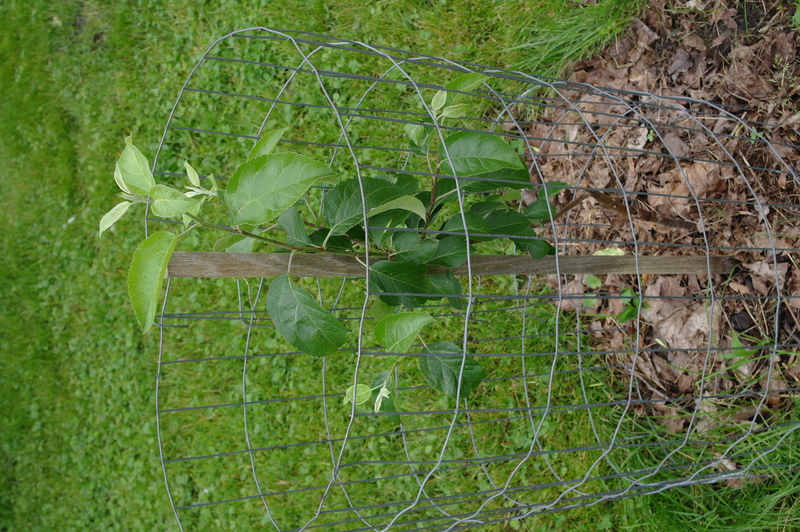 A one year old Liberty apple tree, that I grafted up last year. It has now surbvived two giant wind storms – I think this one is a keeper! This is a grafted Giragaldi, dwarf mulberry. 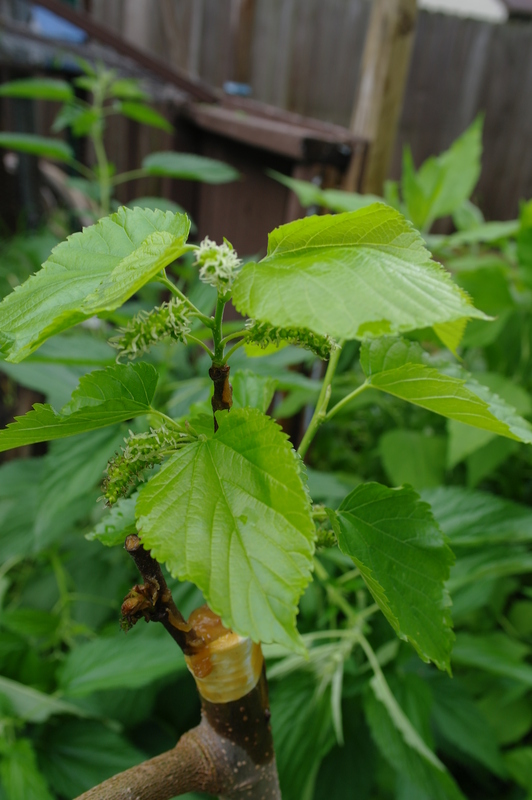 Mulberry trees show up like weeds around here, and are hard to get rid of. 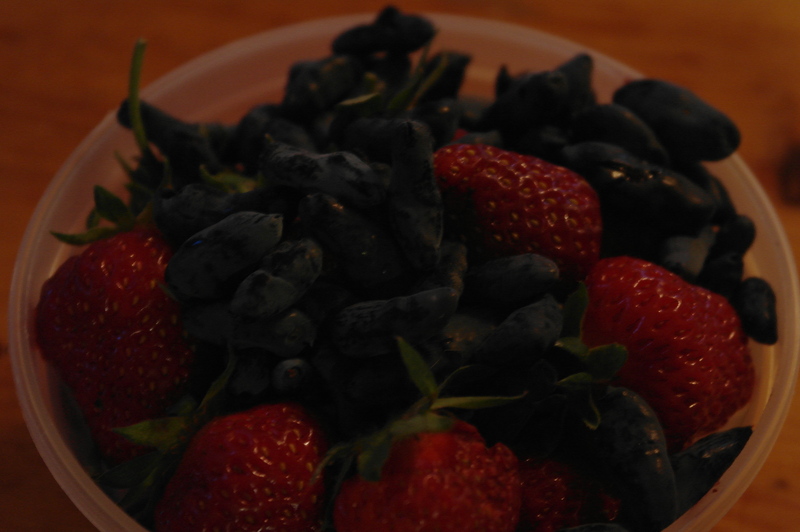 So instead, I turned the problem into the solution and tracked down a dwarfing variety, that has big, tastey berries. Hopefully it survives the winter! With all the rain we have been getting, the mushrooms have been exceptional this year. 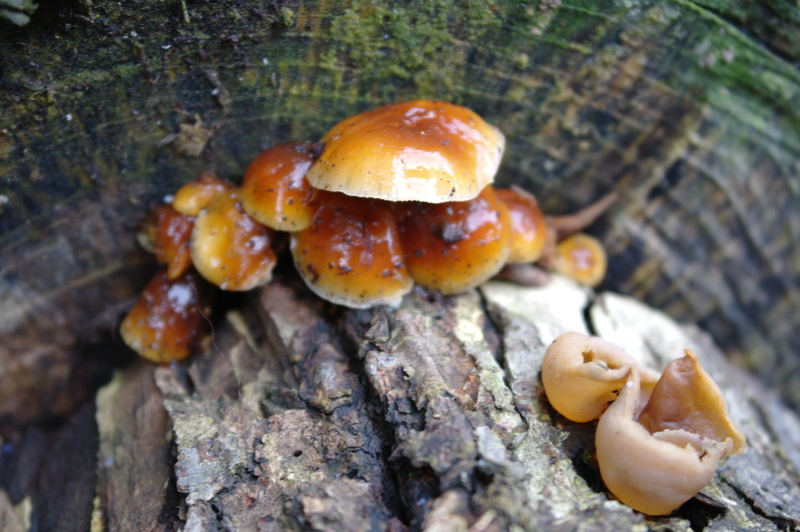 As an amatuer mycologist, I love mushrooms of all kinds and here are two in a beautiful picture – the slimey looking orange ones are called Velvet Feet, or Flamulina Vela tupis. The one on the right I am not sure of, but appears to be a cup mushroom, possibly what is known as a Pig Ear, not sure though?? These are some of our raised bed gardens. These are our workhorses as far as our CSA shares go. 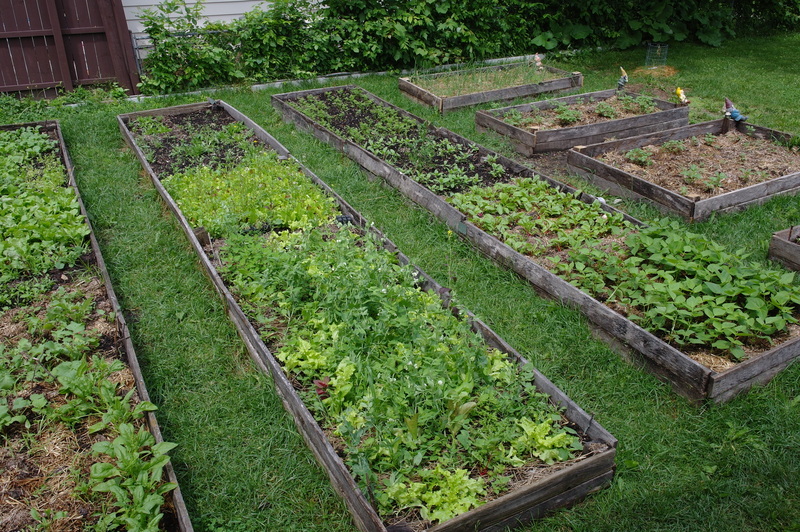 It is amazing as to how much food can be grown in intensively managed beds. Radishes, salad mix, spinach and peas havbe already been harvested with great zeal!! OK, so this one is actually from two days ago, but I had to include it. 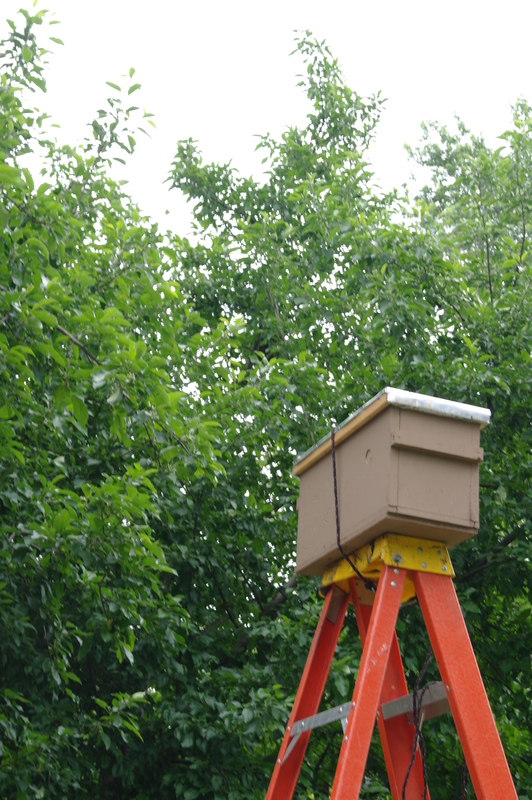 It is one of my swarm traps atop a 12 foot step ladder, in hopes of catching a swarm that issued forth from one of our hives. Saddly the trap did not work, and the bees found a new home elsewhere – hopefully a big, old, hollow tree down at the county park!! Hey everyone! A big heads up to anyone who is in the Twin Cities, Minnesota, Iowa, Wisconsin or other upper Midwest locations. Some dear friends of mine are putting on a great event called the Gathering of the Guilds. It is a chance for people to get together and talk gardening, permaculture, food justice and many more things. Please refer to the info below for details. Hope to see you there!! Peace & Cheers …..
Gates open at Noon on Friday – Come early to set up your camp and help us create the event. This is a COMMUNITY CREATED EVENT. We will provide the infrastructure and logistical planning-YOU provide the knowledge. ALL SKILL LEVELS ENCOURAGED. This gathering will offer local permaculturists, farmers, gardeners, activists, and others a chance to spend a weekend sharing skills, making connections, and learning. This is a family friendly, drug and alcohol free event. There is onsite tent and RV camping, a Community Kitchen to provide 6 meals (bring your garden surplus to contribute), a kids space with ongoing activities. We request a $20 donation to cover toilets, kitchen staples, and site rental. Spring Photos – Part II !! Dear Readers – Due to the time of year, I am once again too busy with gardens and other projects to get any real writing finished. Although I have many thoughts on my mind, and stories to share, I leave you with more photos of what has been going on around the homestead. Once things settle down, I hope to get back into the swing of things, and start putting all my thoughts back into words, but until then … Enjoy … Peace and Cheers!! Here is the addition we just added to the chicken run. Our original run was too small for 6 chickens... They are much happier now, and not nearly as loud!! Freya with a giant morel mushroom!! Here is another perspective of what we found!! On the left is brewer's yeast sourced from a local brewery, in the center is honey, and on the right is bee pollen. These are the makings for pollen patties that will help feed our bees. They should be arriving in the next week or so... updates to follow! Here are about 60 grafted apple, cherry, and plum trees! Some of these are going to be a part of the new cider orchard at my in - laws, some will be planted here at the Autonomy Acres homestead, and some still need homes .... 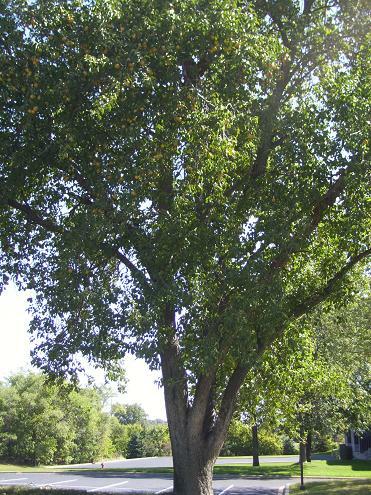 Contact me if you are in the Twin Cities and are looking for a custom grafted fruit tree!! Here is the new blueberry garden. Northland, Elliott, Blue Crop, and Jeresy are the varieties that have been planted. The challenge will be giving them the acidic soil that they need to thrive ... I will touch on this in a future post. Five rows of spuds!! In a few months we will hopefully be pulling out pounds of Yukon Golds, Dark Red Norlands, and Russetts!! Owen exploring the river flats!! 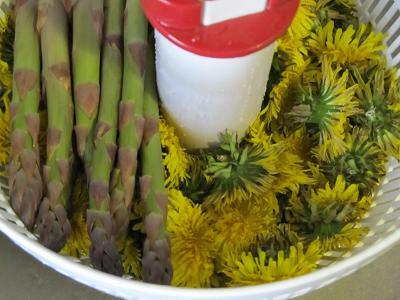 Freshly harvested asparagus and dandelion flowers!! It has taken it’s sweet time to arrive, but I believe spring is finally here in Minnesota. The dandelions are in full bloom, the lawns of the chemical aristocrats are full and green, and the first harvests’ (both wild and domesticated) of the season are starting to come in. After waiting patiently for two years, we are finally able to harvest asparagus from our garden. Asparagus officinalis, has been a cultivated plant since at least the time of the Egyptians, and has always been considered a delicacy because of it’s short growing season. So far we have grilled it and used it in a quinoa salad, sautéed it in butter with onions, and have used it in a ham and cream sauce pasta. As our patch of asparagus matures and fills out, I hope to be able to harvest enough to pickle it. 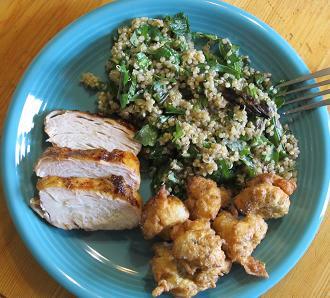 Mother's Day meal - Chipotle, raspberry chicken breast, quinoa salad with spring greens and asparagus, and beer battered, deep fried dandelion flowers! Next up, Dandelions! By far, these beautiful flowers and greens are one of my favorite plants (I have one tattooed on my forearm), both for culinary, and philosophical reasons. Any plant that can grow in the cracks of concrete and society, and blaze the path for the return of wild(er)ness is a friend of mine! I have been eating dandelions for about eight years now. When I first moved into my house, my neighbor, who is of Lebanese decent, turned me onto eating dandelions. We use the greens in salads and pasta, they can be used like spinach in Spinakopeta (a Mediterranean spinach pie) and any other way you might use lettuce or spinach. Another aspect of dandelions that is overlooked is it’s contribution to healthy gardens. Most people think of it as a weed, but dandelions are far from that. Due to their huge taproot, they bring up nitrogen and other nutrients for other plants to use and they also attract beneficial insects for pollination. The day that America can end it’s war against the dandelion will be a good day for our food security, our soils health, and the survival of the honey bee. Another sure sign of spring is mushrooms. Not just any mushroom, but the highly sought after and prized morchella esculenta, or also known as the Morel mushroom. My son and I just found some yesterday while visiting my in-laws out in the country. I have written about morels before so I won’t go into great detail, but for those of you who have never tried them, they are amazing. We ate ours with chives from the garden and scrambled eggs. Probably the best breakfast ever! Depending on the weather, here in the Twin Cities we may have anywhere from a week to two weeks to continue finding them. 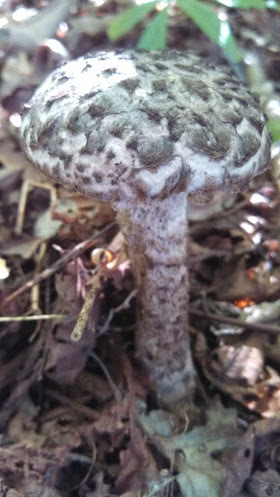 I have a new spot I am going to be hunting this year, and if I have any real success there may be another post about morels coming up!! One last spring edible I would like to share with you is Garlic Mustard. Alliaria petiolata, is a new plant to me. I have heard about it, but never knew what it looked like. All that changed a week or two ago when I found it growing in the back of my yard. With the help of Wikipedia and a few wild crafting websites and books, I made a positive identification and mixed it in with a dandelion salad. It is really good (it actually does taste similar to garlic), but it has a few down sides. According to the Minnesota DNR website, garlic mustard is highly invasive and according to wikipedia, it also suppresses the growth of mushrooms in forests (maybe that is why it is getting harder to find morels in the spring)! Anyways, now that I know what it looks like, it is all over the forest floor. I will continue to use it as a salad green, but I will never feel bad about over harvesting garlic mustard, it is everywhere! Now these are just a few examples of what you can basically get for free in the spring, don’t forget about burdock root, nettles, herbs like lemon balm, mint, chives and many other plants. Keep your options and your palate open and you might find a new food that you can fall in love with! Cheers! Atleast ten pounds of pears that will be turned into pear sauce and preserves! The above definition of glean is slightly antiquated for the fact that the majority of our population now dwells in urban landscapes, but it was not that long ago when people would head out to the freshly harvested fields and collect the fallen and discarded produce the farmers left behind. In some cases it was a charitable act by the wealthy, land owning farmers to help feed their poorer neighbors; in other cases it was easier to leave the undesirable produce in the field then to properly harvest it and cull it out later. Either way, that discarded produce provided a source of nutrition and sustenance to folks who needed it. In the recent economic hard times, gleaning has made a comeback as evidenced in this article. 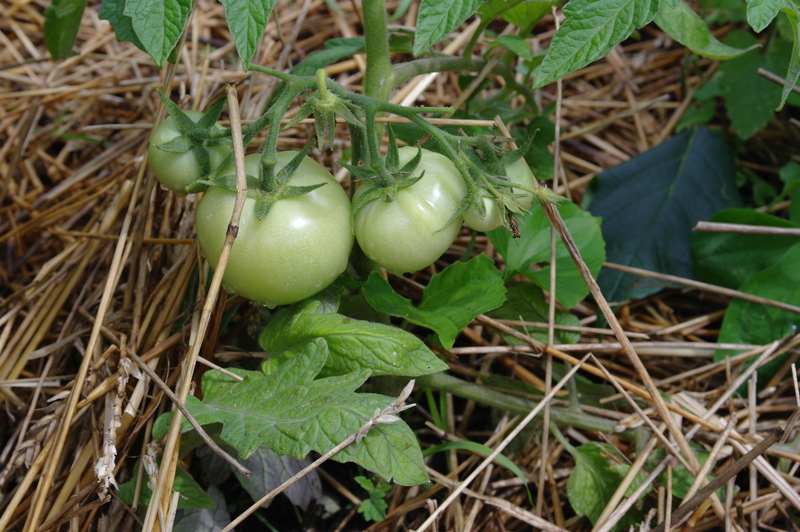 Gleaning has also evolved into another new buzz word, Urban Foraging. This modern take on the age-old practice of gleaning is more akin to wild crafting herbs and fruit than it is to digging through a freshly harvested field, but the results are the same; free food and nourishment for those who want to do the work. A majestic tree - loaded with thousands of pears! I suppose my story of urban foraging starts back in childhood. I can remember grabbing handfuls of raspberries through the neighbors fence and picking apples out of the tree at a friends house. I took summer classes at a nature center near my house and that was the first time I ever ate dandelions. Those early experiences with free food have obviously stuck with me and is probably part of the reason I do the things I do. In more recent years in the wake of Peak Oil and the local food movement, we here at the Autonomy Acres family have started to pay much more attention to all the possibilities of free food in our neighborhood and surrounding semi-wild areas. We have our perennial hikes and forays into the woods hunting edible mushrooms, wild onions, making notes of where the giant stands of wild grapes can be found and where the elderberries grow. 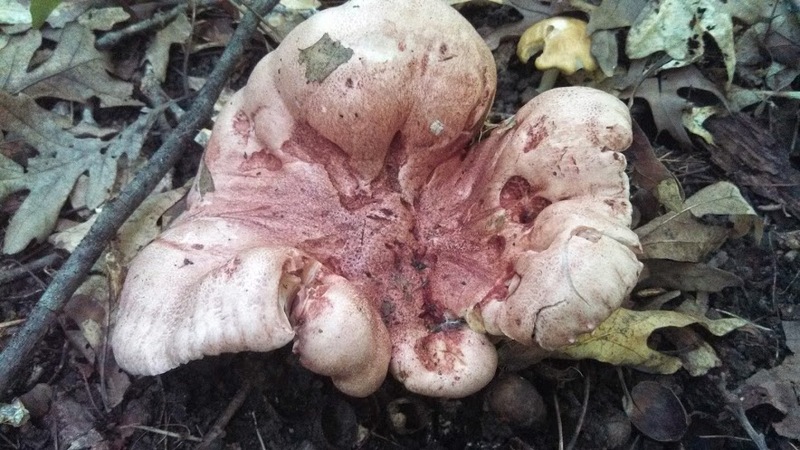 I know a tree stump down in the river valley that has had hundreds of pear-shaped puffballs on it every October for the last three years and a stretch of railroad track that has the sweetest blackberries that ripen every July. Hiking up from the river valley and back into our urban neighborhood, we have started to make mental notes of all the different fruit trees that grow around town. There are crabapples galore (not much good for raw eating, but you can make crabapple preserves and chutneys, and they are also a great addition to hard cider), mulberries (kind of like a black berry from a tree) that are great in pancakes and jams, cherries (both domesticated and wild), apples, and pears. It is the last three that I want to talk a little more about. The apple, cherry, and pear trees typically grow on private property rather than on public boulevards or city parks. Don’t let this stop you from at least attempting to harvest these fruits. Go talk to the homeowner, introduce your self and explain what you are hoping to do. More often than not the homeowner will graciously allow you to help yourself to at least some of the fruit, if not all of it. A lot of people love having a fruit tree in their yard, but hate having to clean up the fallen fruit, so they are more than happy to have someone come and clean it up for them. Now if you are lucky you might know of a good fruit tree that is on public property, or property that is no longer occupied or cared for. In the last two years we have found an apple tree and a pear tree. The apple tree is on a boulevard behind a Baker’s Square restaurant and the pear tree is on a boulevard of an abandoned and for sale industrial site. Both trees are probably hold-outs from a time when that land was still agricultural homesteads and they are still producing an abundant amount of fruit. Having access to free food, especially the fruit trees is quite a treat. Not only does it help to sustain our bodies and minds, it is also a welcome challenge for our culinary skills. 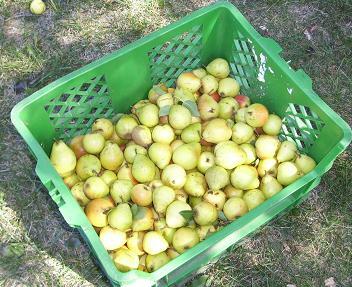 What do you do with a hundred pounds of mixed apples and crabapples that are slightly blemished? Well if you have the right equipment you can make cider – either hard or soft. How about apple sauce? Apple butter? Chutneys’ and relishes, or pies and tarts! The same goes for the pears and cherries. If you are finding morels in the spring, puffballs and chanterelles in the summer, and oyster mushrooms in the fall you can dry them, marinate them in oil, vinegar, and herbs, or just eat them fresh. How about those raspberries and mulberries from the neighbors yard, make jams and jellies. The possibilities are all delicious and rewarding. Any way you cook it, free food is priced right and is good for the soul, happy gleaning! Cheers! Building a world of resilient communities.